Make sure to verify the email addresses associated with your GPG key. Don’t forget to add said email(s) to your .gitconfig file. 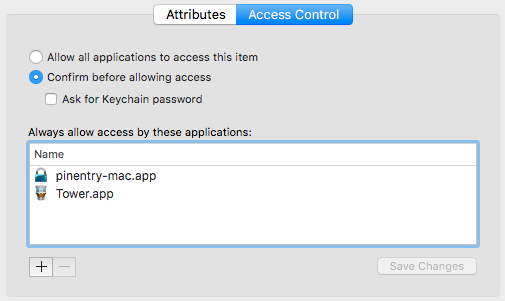 Download GPG suite, which will enable adding key(s) to the macOS keychain. Before proceeding, please check for existing keys and make backups!!! To list keys in secret keyring run: gpg --list-secret-keys. See existing keys. Check out the GitHub docs for a more in-depth explanation on how to generate a GPG key. TL;DR gpg --full-generate-key and follow prompts; if it doesn’t work read the GitHub doc ^. If everything went okay you’ll see a bunch of text and it’ll display: public and secret key created and signed. To add GPG key to GitHub navigate to Account > Settings > SSH and GPG keys > New GPG Key. Export key by running gpg --armor --export 5E6D89E5F4A1A2FC. I like to pipe long text into pbcopy to avoid manually copying. E.g., gpg --armor --export 5E6D89E5F4A1A2FC | pbcopy and paste into Github > GPG keys / Add new. See this article for adding the key to macOS keychain. Briefly, on your first git commit you’ll get a prompt from pinetry-mac asking for your passphrase (to unlock GPG key). There is a checkbox to “add key to keychain”, make sure it’s checked. Then go to System Preferences > GPG Suite (bottom-most of window) > make sure “Store in macOS Keychain” is checked. “Confirm before allowing access”, this option enables you to add applications as needed. E.g., I use Tower (my fav git client for macOS). gpg --edit-key 5E6D89E5F4A1A2FC which will drop you into gpg>; type adduid and follow prompts. Type save / <enter> for Save and Quit or quit to exit. NOTE: if you add another email you’ll need to remove the old GPG key from GitHub and re-upload the edited version. Just run gpg --armor --export 5E6D89E5F4A1A2FC | pbcopy.